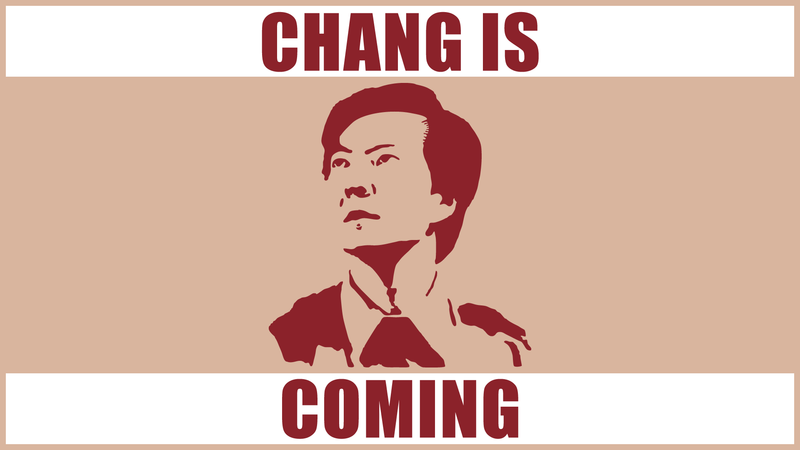 “Community” – Arise, Chang Army! *NOTICE – If I did happen to guess WRONG at what is at the bottom of this poster, I WILL be adding a corrected version. Wallpaper sized: (104kb) (2560×1600) – Download Here! - Also, a 16:9 ratio wallpaper: (62kb) (1920×1080) – Download Here! Gloriously full-sized poster: (714kb) (7,200×10,800, which is 24″x36″) – Download Here! This one is so Chan-tasticly huge it probably won’t load into most browser windows. Based upon the Chan-tastic Chan poster being unfurled in the “Community Returns!” trailer. Obviously, I’m just guessing at what’s actually at the bottom of that poster. Come March 15th, the full Chang shall be revealed! All images are in png format, created in Photoshop CS5. anyone else that would like to dogpile in on some of this copyright action. 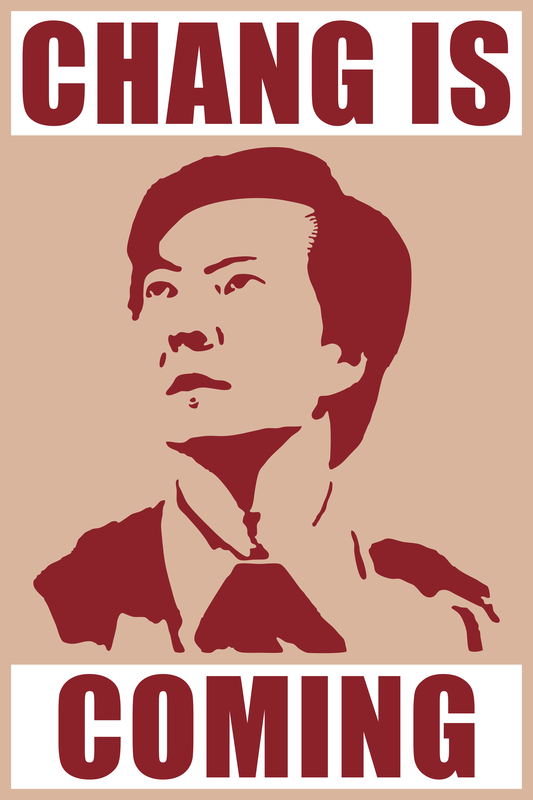 *This page is in fandom spirit of the AMAZING NBC comedy Television show “Community“. If you’ve never seen it, do so NOW and level up your coolness by a roll of at least +10. *So, realize this is all in fun and therefore I am not a communist. *I am also not a rabid celebrity stalker of Ken Jeong. This entry was posted on March 9, 2012. It was filed under 2D CGI, Artwork, Photoshop, Posters. Personally, I don’t think there’s anything at the bottom of that banner. I took it as a reference to the DC Comics character Darkseid, specifically as he appeared in the JLA story “Rock of Ages.” Take a look at the cover of JLA #14, the fifth chapter of that storyline: JLA #14. Having said that, very nice job on this! I downloaded the desktop background. Thanks for posting it! Awesome poster! 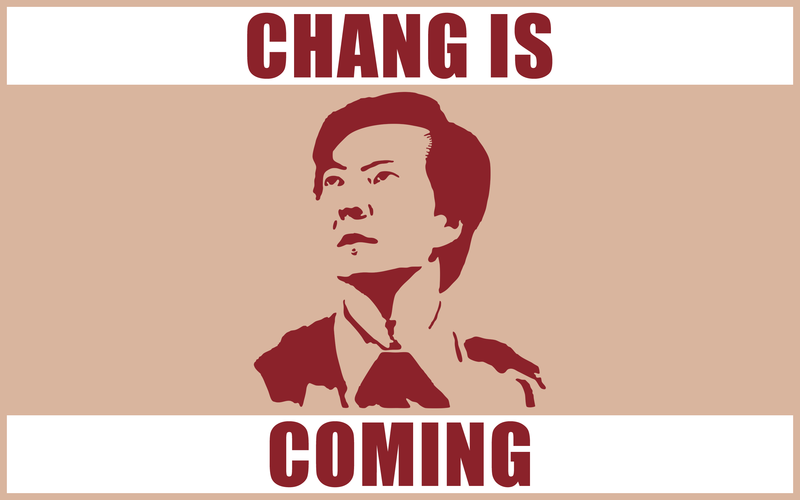 I’m getting ready to get chang-ed! Great job! Can you make a 16:9 version for those of us with full widescreen monitors? We’ll find out what (if anything) is at the bottom of our Glorious Chang’s poster on March 15th and then after the show…I’m sure I’ll be in here posting up my corrected poster. Yes, I’ll whip up a fresh (16:9 ratio) wallpaper and get it uploaded later tonight. Okay, I uploaded a 16:9 ratio wallpaper, now available way up there (1920×1080). - It’s also a possibility that it could be a reference to the “Game of Thrones” motto which is “Winter is Coming”.